Donté Greene of the NBA's Sacramento Kings saved a woman from drowning on Memorial Day. (CNN) -- A man sees a 75-year-old man stuck on railroad tracks and pulls him to safety. An off-duty emergency worker pulls a woman from a van after it crashes into an icy pond. An NBA star saves a woman from drowning. A postal worker helps a mother whose baby is unconscious. A father goes into a house engulfed in flames to save two of his children, then returns to save the family's pet. These are examples of everyday people who, when confronted with a life-or-death situation, jumped in to do what they could -- and became rescuers and heroes. CNN.com takes a look at some of the stories of heroic acts that happened throughout the country in the past 12 months. Donté Greene is used to being looked up to. 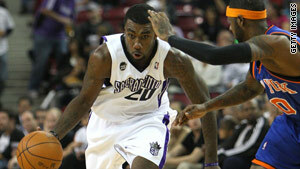 He is a 6-foot-11 player for the Sacramento Kings of the NBA. But on Memorial Day he became a lifesaver. Greene and some friends were on a boat in the American River near Discovery Park in Sacramento, California. Greene told CNN affiliate KCRA that he heard some yelling and then a splash. A woman had been pulling a ladder onto her boat, and she was thrown into the water when the driver pulled away. Greene saw the woman flailing in the water and dived in. "I honestly don't even think I was thinking -- I was just reacting," he told KCRA. "I was pretty confident in my swimming abilities." Tony Gerdom, an emergency medical worker from Iowa, was driving off-duty on December 7 when the van in front of him suddenly swerved off the icy road and fell into a pond. The cold weather had frozen the locks and windows on the van, trapping driver Kathy Van Steenvik. Gerdom took a tire iron and smashed the van's passenger side window to free the driver. A second man, Brian Ford, held onto him with a rope while Gerdom descended into the pond. Each man shrugged off his hero label. "I'm just the lucky idiot that jumped in first," Gerdom told CNN affiliate WHO in Des Moines, Iowa. "No matter how cold the water was, it's this overwhelming feeling that I helped save a life. It's tremendous," Ford said. All three were treated at a hospital for minor hypothermia. In Sacramento, California, Robert Sweeney had just about finished delivering the mail on December 11, 2008, when he heard a panicked mother's cry for help. Her baby, 19-month-old Kelly Jimenez, appeared lifeless. Sweeney took the child, placed her on the grass in front of the woman's home and performed CPR while neighbors called 911. Sweeney revived the child before paramedics arrived, CNN affiliate KCRA reported. Sweeney told KCRA that the emotion of the moment didn't hit him until he got back in his truck to go home. That's when he started crying. "You don't ever think you would be in a situation like that," he said. A Michigan father jumped through flames to save his two youngest sons when an electrical fire set their house ablaze December 7. Investigators told CNN affiliate WZZM in Grand Rapids, Michigan, that sparks from an electrical outlet set a living room curtain on fire. After climbing up pitch-black stairs to rescue his 4-year-old and 2-year-old boys, Jonathan Brito went back in the house and pulled out Punchy, the family's dog, who was unconscious. Brito performed CPR and revived the dog, Brito's wife, Charlene Hernandez, told the station. "He got the dog to breathe," she said. "[Punchy] coughed up some smoke and took off running." Brito and Hernandez's other two children were at school when the fire started. The couple, who both work night-shift jobs, lost their clothes, furniture and some Christmas presents. "Thank goodness everybody got out of the house safely," Brito said. "If I've got to jump through fire to save my kids' lives, that's what I'm going to do." Truck driver Ronald Tobias, 73, of Syracuse, Indiana, was trapped after his propane tanker truck flipped on its side and exploded. But rather than running from the flames, two people headed toward them. Lonnie Hood, 30, from Acton, Indiana, and Robert Skaggs, 49, from Fortville, Indiana, each decided they had to try to help save Tobias on October 22. Hood was working on a nearby construction job and ran over. Skaggs was in his car on Interstate 465 when he saw flames behind him, stopped, and put his car in reverse. "I just jumped off [a second-story roof] and ran to it. I don't know, I was kind of feeling something telling me to get over there," Hood told CNN affiliate WRTV of Indianapolis. "I just kicked [the window] real hard and it went right in, and I just grabbed him up, me and another guy, and pulled him up to higher ground." Added Skaggs, "For some reason, I just jerked the car off to the side, threw it in reverse and took off backwards toward it." For their actions, they were awarded the Governor's Heroism Award by Indiana Gov. Mitch Daniels. Michael Woodson had already made news in Brevard County, Florida, as a bombing suspect when he rushed to help a man about to be run over by a train in April. Woodson, 21, had been accused of filling a liquor bottle with black powder and setting it off at Brevard Community College to get out of class. But in April he saved Michael Chergosky, 75, who was trying to cross railroad tracks in a motorized scooter. Chergosky's scooter had become stuck in gravel, and Woodson ran over to pull the man to safety as a train approached, reported CNN affiliate WFTV in Orlando, Florida. "As soon as I got to him I grabbed him out by the back of his collar, pulled him out of his wheelchair. [The train] missed him by four or five inches," Woodson told the station. Several witnesses saw the rescue, and police said there's no doubt Woodson saved Chergosky, the station reported. The station reported later that Woodson was sentenced to probation, 15 weekends of work at a sheriff's work farm and banned from the school in a plea deal. The heroic deed was not mentioned in court, the station said. Woodson said he never intended for the device to blow up, that it was just supposed to let off some smoke. The judge, who could have sentenced him to 15 years in prison, told Woodson he was lucky no one was injured. "I hope that each and every day when you are standing out there in the sun you contemplate where your life could have gone if something else had happened," the judge said.